Pole Creek Golf Club invites you to join us at our clubhouse restaurant, Bistro 28. The Bistro features unique made-to-order cuisine infused with international flavors, using local and organic produce whenever possible. Pole Creek Golf Club’s restaurant is currently open seven days a week from 8:00am to 8:30pm. Bistro 28 serves breakfast, lunch, and dinner to golfers and restaurant patrons alike. You don’t have to be a golfer to enjoy our delicious dining and beautiful restaurant views! Breakfast options include egg dishes and scrambles, French toast, and breakfast burritos. Lunch features a deliciously diverse mix of menu items from around the world, such as spring rolls, tacos, and calamari, in addition to classic lunch offerings such as burgers and sandwiches. Gourmet entrees are available for dinner, including Rocky Mountain trout, seafood, steaks, and poultry dishes. The Bistro also features dinner specials every night of the week. Join us Tuesday for Burger Night, Wednesday for Family Night, and Thursday for special culinary creations from our Chef. We also feature Fish Fridays and Prime Rib Saturdays. Our Happy Hour is great as well, with buy-one-get-one draft beers and well cocktails, as well as 20% off appetizers, every Sunday-Thursday from 3-5pm. Happy Hour also features a daily $2 call drink special, so each day brings a unique new drink to try! Our restaurant is a particularly delicious way to cap off a round. After playing our 27 holes of mountain golf, join us at the “28th Hole,” Bistro 28. 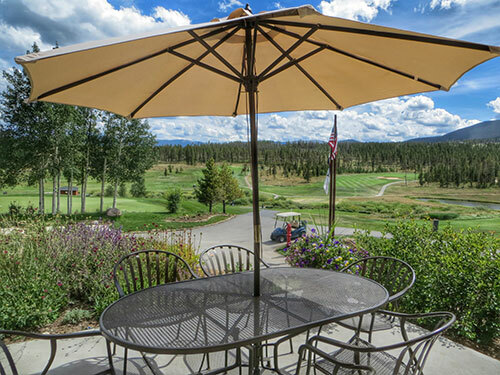 It’s especially enjoyable to sit on the Bistro’s patio, taking in the views of the golf course and the surrounding Rocky Mountains while you enjoy dinner and drinks. Or you can even call the Bistro on the 9th tees and your food will be ready at the turn! Bistro 28 will stay open 7 days a week until the golf course closes, which all depends on snow. Come wintertime, the Bistro will be open Thursday-Sunday from 4:30-8:30pm, in addition to being open for special events. Most seasons we can golf until mid-October, which means you still have plenty of time to play a round and enjoy delicious dinner at Bistro 28 too! Contact us soon for tee times and dinner reservations! To contact Bistro 28, call 970-887-9797.